Folk songs have always had a special place in music. Pleasing melodies, singable lyrics, and a lasting message are some of the factors that make folk songs endure, and the English folk song The Water Is Wide (also known as O Waly, Waly) is no exception. Dating to the seventeenth century, The Water Is Wide has been a consistently popular folk song due to its bittersweet lyrics and poignant melody. The Water Is Wide has been recorded in many ways, by many artists, including famous Irish tenor Anthony Kearns, as well as Bob Dylan and James Taylor. This arrangement of The Water Is Wide features a simple melody in the flute that evolves as the piece progresses, and an interesting piano part that is full of lush harmonies. 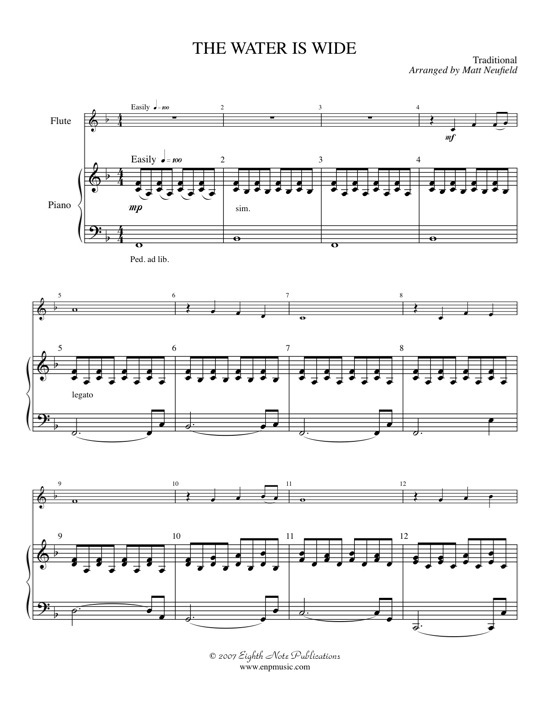 This folk song is ideal for use at a competition, as a concert or recital piece, or at church.